The medieval watchtower of Ponte sull'Arno is located at the gates of the medieval town of Pratovecchio. Built by the Guidi Counts in the mid-11th century, it is the first historical building that together with the ancient walls encircled the village of Pratovecchio. Here, it is possible to spend an enchanting stay immersed in history: after a careful restoration it was realized, in fact, a beautiful independent residence equipped with every comfort and air conditioning. The medieval tower is spread over three floors on a surface together with the terrace of about 100 square meters. The access is located on the 1st level through the typical wooden staircase (33 steps) and leads into the hallway equipped with clothes hangers and entrance into the master bedroom (20 sqm) with majestic walls cleverly built and restored, enriched by decorations that recall the feudal period. In each wall of the cozy room there are the typical loopholes overlooking the Arno river and the garden. Inside the room access to the private bathroom (4 sqm), built respecting the architectural forms of the structure and provided with toilet, bidet, shower and antique marble sink. From the hallway a staircase leads to the living (28 sqm) very bright with antique sofa, armchairs, TV SAT, dining table with four chairs, closet and characteristic wooden kitchen equipped with: fridge-freezer, dishwasher, oven, two burners and antique marble sink. From the living a staircase with nine steps leads to the mezzanine (10 sqm) with a comfortable single bed and second bathroom enriched by external decorations that show the various castles of the Valley and equipped with toilet, bidet and sink. From the mezzanine a few steps lead to the panoramic terrace. Internet access must be booked (for a fee). 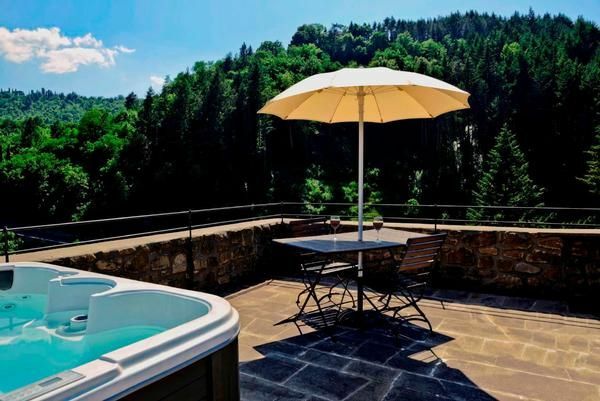 The highlight of the medieval tower is certainly the enchanting panoramic terrace (35 sqm) overlooking the Casentino Valley, the medieval castles of Poppi, Romena and Porciano. The terrace is equipped with Jacuzzi, solarium, night lighting, roof garden, lava stone barbecue, drinking water, dining table and chairs. Here you can organize enchanting romantic candlelit dinners under the stars. On request, possible use of the pool about 1.5 km, to be shared with other guests, or the river Arno bordering the residence. The owners wait for guests with their specialties, both on arrival and every mid-week. The tower does not have a washing machine, but there is a laundry in the center of Pratovecchio. The Adriatrico sea is approx. 90 minutes and the Tyrrhenian Sea approx. 120 minutes by car. It is possible to swim in the lake which is approx. 1.5 km from the center of the village of Pratovecchio or Stia in the Arno river. Excursions can be made to the Poppi zoo park, to the Sanctuary of La Verna, to the hermitage of Camaldoli and to the Casentinesi forests national park. Florence and Arezzo are a 50 minute drive, Siena 80 minutes. From Arezzo you can get to Rome by fast train only in an hour and 5 minutes, so that you can also take day trips to the capital in1 hour. pool shared at 1,5 km. 6€ per person one day : per object and day according to consumption (Mandatory). Internet: per object and day Costs amounting to 4 EUR (optional). Cot for adults: per person and day available and included in price (Mandatory). Cot (Per property and week, to be brought by the traveller 40 EUR). Cot for adults (Per property and week, to be brought by the traveller 80 EUR).